What does the future hold for Howard Middle School? 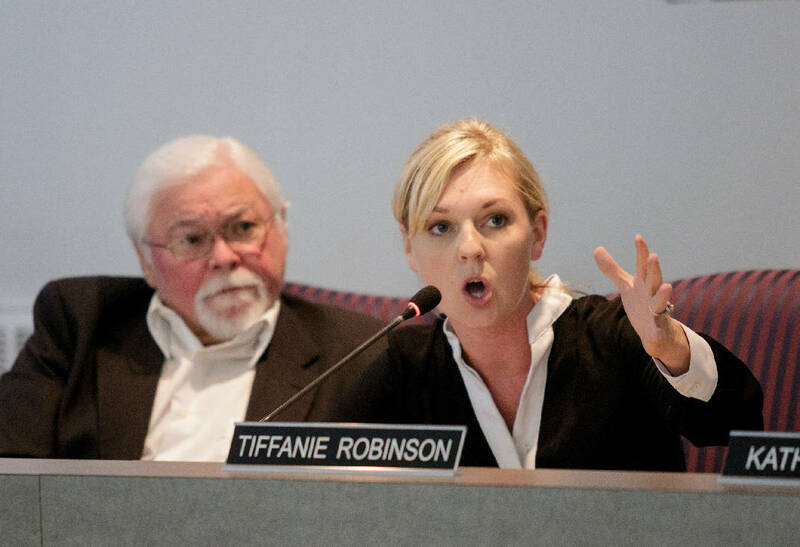 Board member Tiffanie Robinson, right, speaks next to board member David Testerman amid a discussion about equity in the school system during a Hamilton County Board of Education work session on Thursday, June 21, 2018, in Chattanooga, Tenn.
Students, families and community members are invited to a meeting about the future of the new Howard Middle School. Hosted by school board member Tiffanie Robinson, of District 4, the meeting is intended to allow school leaders and administrators to hear from families and brainstorm design, curriculum and other plans for the new school, which is scheduled to open in 2019. "At this point, the school is a complete, wide-open, blank slate," Robinson said. "Our goal is to create a very unique and creative plan for this middle school." The new school will serve students in The Howard School's feeder pattern, but all community members are invited to attend. The event is at 5 p.m. Thursday at The Howard School, at 2500 Market St.
Staff from the STEM School Chattanooga recently attended a World Digital Fabrication and STEM event in Toulouse, France. Staff from two schools in the United States were invited to participate in a leadership cohort for scaling digital fabrication in K-12 education at the FAB14 conference. The conference brought together international digital fabrication experts for several days of training and workshops. "Digital fabrication is accelerating at a rapid approach in society," said Tony Donen, principal of STEM School Chattanooga, in a statement. "As part of the experience at Fab14, we worked with experts who are creating 3-D printed food machines where you can choose the vitamins and minerals you want in your food, Airbus staff combining autonomous vehicles with personal flight vehicles, and companies creating collaborative fabrication lab networks to develop the world's largest manufacturing sector." The group also led sessions on how digital fabrication is incorporated into curriculum and the classroom at Chattanooga's leading science and technology school. Chattanooga State Community College is hosting its second Cyber Seniors Computer Skills Workshop next month. The workshop is designed to bridge the gap between technology and those who might not be very familiar with how to use computers, tablets or smartphones. The program is a service learning project, developed originally by Chattanooga State's Savitha Pinnepalli, head of the information technology department. It pairs senior participants with information technology students, who serve as mentors. Participants will receive training and assistance based on their individual technology needs. Upon completion of the workshop, participants also will receive a certificate of completion. The workshop will be from 11:30 a.m.-2:30 p.m. on Sept. 17 in Room 1002 of the Health Science Center at Chattanooga State's main campus, at 4501 Amnicola Highway. For more information, call Savitha Pinnepalli at 423-697-4756 or email savitha.pinnepalli@chattanoogastate.edu. For the second year in a row, AT&T has donated $81,000 to the Tennessee Colleges of Applied Technology to enhance student training programs in computer information technology, which will help address critical workforce development needs throughout Tennessee. The donation, funded through AT&T's philanthropic arm — AT&T Aspire — will provide each of the 26 TCATs offering computer information technology courses at least $3,000 to purchase new wireless networking setups to improve course offerings and assist students in implementing their curriculum. "Tennessee needs more Information Technology professionals to fill the surging number of jobs today and ahead. This contribution from AT&T will help our technical colleges provide the critical training, on the newest technology, that students need for these jobs. Our students, their families, and our state will benefit for generations to come," said Flora Tydings, chancellor of the Tennessee Board of Regents, in a statement. The 2017 donation allowed TCATs to purchase network storage units and hard disk drives, according to a news release. Haley Rigsby, a senior at STEM School Chattanooga, was one of 20 high school seniors selected to participate in BASF's eighth annual Science Academy this summer, at Fairleigh Dickinson University in Madison, New Jersey. Students had the opportunity to earn three college credits, increase their knowledge of chemistry and learn marketable business skills, according to a news release. "We want to ignite a passion in students to follow their interests in science and adequately prepare the next generation of leaders in innovation," said Robert Gagliano, site director for the BASF facility in Chattanooga, in a statement. "Our two-week program also promotes the business skills that can help our graduates succeed in the real world." During the academy, students worked in teams to create their own personal care products, such as hair gels, shampoos or lotions and develop a marketing plan. "My favorite aspects of BASF's Science Academy were making memories and exploring New York City with the friends I've made through the program," Rigsby said in a statement. Alumni of the program have the opportunities to return to BASF for internships and are offered $5,000 scholarships if they decide to attend Fairleigh Dickinson University.